From the beauty of an incredible sunset, to the joy of watching your grandkids discovering something new, seeing is believing. Nothing is more critical than your eye health. Currently about 1.75 million Americans have advanced age-related macular degeneration. That number is expected to hit 3 million by 2020. Dr. Krawitz performs 1,000+ eye surgeries a year, in addition to being a professor and professional lecturer in his field. He is passionate about helping people maintain their eye health. Vision Performance is designed with the right nutrients to help support sharp vision and healthy eyes for a lifetime. Lutein, Zeaxanthin and Astaxanthinare compounds give marigolds their brilliant yellow and red color. These carotenoids are absorbed by the macular area of the eye and help absorb blue light, thereby supporting contrast and sharpness. Flavonoids promote a healthy flow of blood to eye and helps support retinal health. Curcumin in turmeric is a powerful anti-inflammatory and can help protect the optic nerve. Cyanidin-3-Glucosides found naturally in black currants supports the eye's ability to recover when transitioning from light to dark situations like coming indoors on a sunny day or entering a tunnel when driving. 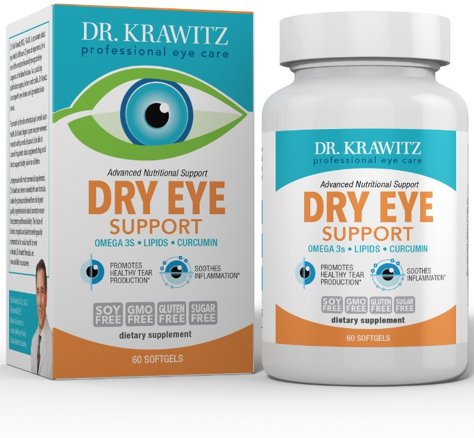 In addition to the benefits of antioxidants, like those naturally occurring in the ingredients above, we add Grapeseed Extract, N-Acetyl Cysteine, Quercetin, Rutin, and Taurine for a powerful complex that can help fight free radical damage which can lead to age-related eye diseases. Macular degeneration destroys the delicate cells in the central part of the retina, known as the macula. This part of the eye provides the central vision we need for reading and seeing details. Macular Support nourishes the macula with key nutrients. Lutein and Zeaxanthin are absorbed by the macula and help increase healthy retinal pigment and visual contrast. Zinc breaks down retinal toxins, supports protein synthesis and cellular healing, and is an important cofactor for many antioxidant enzymes. A complete antioxidant complex has been clinically shown to fight the free radical damage and inflammation that leads to cellular degeneration. Dry Eye Support addresses the entire tear film chemistry, bringing superior results for tear production, moisture retention and overall eye comfort to provide all day relief. Triglyceride Omega 3s encourage healthy function of the lacrimal glands to support adequate tear production. The key component of the Meibomian glands of the eyelids, phytosterols coat the tear film with an impenetrable lipid layer to improve symptoms arising from excess tear evaporation. As a COX-2 inhibitor, curcumin helps reduce inflammation & irritation.